La Veta is a little jewel of a town, rough around the edges but shiny inside. Dusty streets and some empty storefronts are the rough spots. But lovely Victorian cottages, some good restaurants, shops and galleries are a bright plus that only adds to the beauty of the setting. Known as an artists’ colony, La Veta is enough off the beaten track to stay quiet and picturesque. The town of about 800 people is nestled up against the two Spanish Peaks, once called “the breasts of the world.” The startling mountains rise some 7,000 feet above the valleys. Through the 1880s the valley was sacred to the Ute people, who came there to cleanse in the springs and purify on the way to the peaks. The Tarahumare Indians believed the Spanish Peaks to be the place where all life emerged. 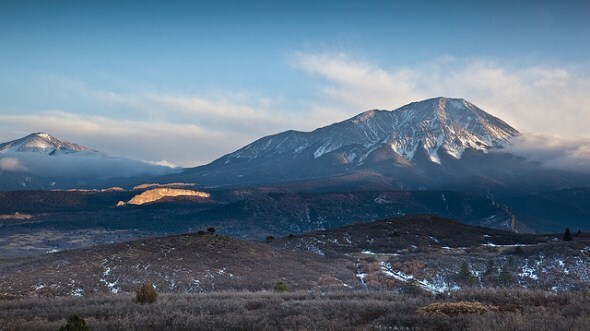 Spanish explorers in New Mexico reported the existence of the landmark peaks, which can be seen for 100 miles. When they noticed the mountains nearby that turned red at sunrise, they named them Sangre de Cristo, or “blood of Christ.” Other prominent Spanish names in the area are Cuchara, meaning “spoon,” and Huerfano, “orphan,” which refers to a lone butte standing east of Walsenburg. Nearby Cuchara is now mostly a summer resort. County: Huerfano (Walsenburg is county seat). Altitude: La Veta 7,013 feet above sea level.